It can change names as many times as it likes, but the wine producing Languedoc area of southern France remains one of my favorite places in the world. More and more people are getting to know its wines, but property prices don’t appear to be reflecting the area’s growing appeal. The Languedoc region is sometimes referred to as “The Other South of France” because it is not neighboring Provence or the Côte d’Azur, but it is geographically the most southern part of France, with Provence-Alpes-Côte d’Azur to the east, the old Midi-Pyrénées to the west, the Auvergne to the north, and Spain to the south. Historically Languedoc was a province of France, it’s only in recent times that Roussillon was added, turning the area into a region. The original Languedoc has a fascinating history and even its own language, Occitan, which is similar to Catalán, from just over the border in Spain. It’s from “Occitan” that the region’s new name is derived. 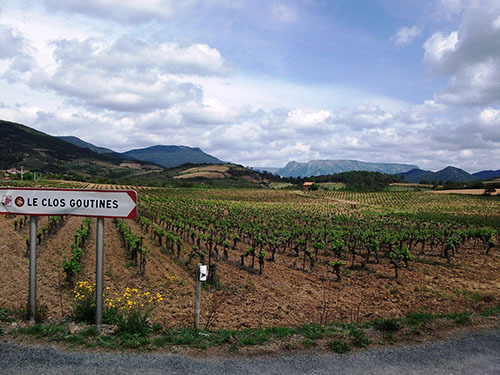 At the beginning of this year, Languedoc-Roussillon was merged with the neighboring Midi-Pyrénées region, and the area was renamed Occitanie to become one of 13 new super-regions. That said, I don’t see anyone referring to the Languedoc in any other way, at least for the foreseeable future. Locals actually snorted at me when I asked if they would say they now lived in Occitanie. But it’s worth knowing it exists, as you may see Occitanie on tourism and real estate websites. The new Occitanie has 13 departments, five from Languedoc-Roussillon and the rest from the Midi-Pyrénées. I’m zooming in on the Hérault department of the old Languedoc, which has hundreds of inland and coastal villages and towns, two pretty rivers, lots of vineyards, a beautiful national park, lakes, beaches, and good accessibility (See “Getting to the Languedoc” below.). Firstly, property prices in the South of France push many would-be expats to explore a little further west. 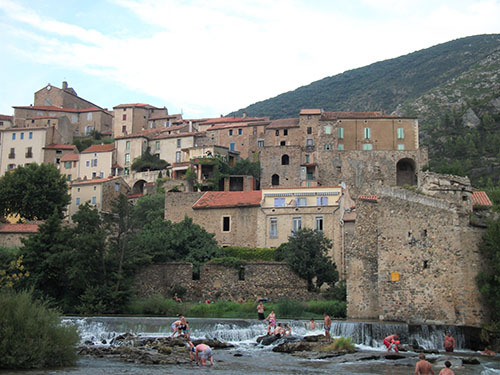 In the neighboring Languedoc, they find a similar Mediterranean climate and property selling for half the price of those in Provence and the Côte d’Azur. Good news travels fast and expats of many nationalities, but most notably the British, Scandinavians, and Dutch, have moved in. But not too many to spoil things. Secondly, wine. For decades, the Languedoc produced vast quantities of quaffable vin de table, but nothing very notable. When my parents first moved there in 2005, the region was still turning out barrels of inexpensive wine. However, over the last decade or so, growers have specialized and built on the AOC status (appellation d’origine contrôlée) created in 1982 and are now producing world-ranking red wines from the original Carignan, Cinsaut, and Grenache grapes, with the addition of Syrah, Grenache, and Mourvèdre varieties. A solid sign of the area’s wine popularity is that Saint-Chinian wines now feature heavily in all U.K. supermarkets… no mean feat in a such a competitive environment. Surprisingly, not all property prices have shot up; those that remain attractive to non-French buyers (i.e. character properties with original, mostly 19th-century features) are still good deals, while new builds of all sizes attract higher prices. Over the years since I’ve been visiting, I’ve picked out a few favorite villages. 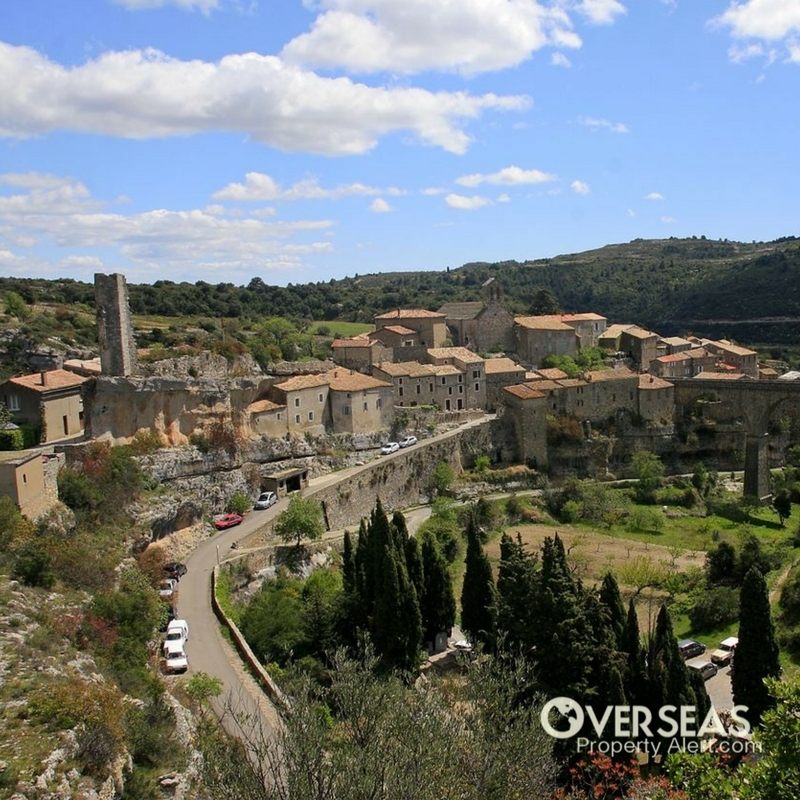 In this week’s Overseas Property Alert, I’m focusing on three of them in the Hérault department: Cessenon-sur-Orb, Saint-Chinian, and Roquebrun, all within a 20-minute drive of each other. Why these three for Overseas Property Alert readers? They sit in the Hérault’s beautiful Orb and Vernazobres valleys where the scenery is fabulous; each one has local facilities, including bakeries, a mini supermarket, doctors, restaurants, bars, banks, and even beauty salons, all in walking distance of most village properties; they all have plenty of activities to keep you or rental visitors happy; and they all still have affordable property for sale right now. Here’s what I’ve found listed with local agents Caroux Immobilier, Agence GTI, and Moerland Immobilier. GTI has a three-bedroom, 88-square-meter (94-square-foot), refurbished townhouse in Saint-Chinian in move-in condition (Ref: M3063). The property has original, red floor-tiles, exposed beams, and an open fireplace. There are two non-refurbished attic rooms (18 and 28 square meters/194 and 301 square feet), which could be connected to make a large bedroom or study. Listed at 69,000 euros with the option to purchase an unattached, large garage for 20,000 euros. Again with GTI, I found a 130-square-meter (1,400-square-foot), detached four-bedroom villa with a garage on 575 square meters (6,190 square feet) of land listed for 252,000 euros (Ref: M 3100). The property has a fitted kitchen, workshop, covered terrace and barbecue, fireplace with a woodstove, and oak flooring in the bedrooms, good for the chilly winter days. For just 79,000 euros you could invest in a 77-square-meter (829-square-foot), two-bedroom pied-à-terre in the center of Cessenon-sur-Orb. It has a cellar and two storerooms as well as a courtyard and a terrace. The 167-square-meter (1,798-square-foot), five-bedroom maison de maître (mansion)—pictured below—needs attention, but it’s a great find if you like the bourgeoisie architectural style. It has a south-facing courtyard and a 120-square-meter (1,290-square-foot) garage. 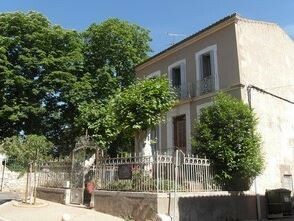 Listed for 179,000 euros (Ref: M 3054). Caroux Immobilier has a 110-square-meter (1,184-square-foot), three-bedroom, typical Languedocian, stone village-house for sale for 199,000 euros. It has a pretty, private courtyard and an attractive living area. It’s harder to find properties in Roquebrun because it’s smaller than Saint-Chinian and Cessenon and very popular for vacation lets. However, Moerland Immobilier lists a pretty, 250-square-meter (2,690-square-foot) house, with a small terrace that has been restored and outhouses and storerooms that are not restored. Price 239,000 euros. At the entrance to Roquebrun village there is a single-story, detached, 70-square-meter (753-square-foot) house for sale with a cellar and beautiful, original floor tiles, sitting on 300 square meters (3,230 square feet) of land. Because it needs a complete internal refit, this property does not meet my criteria, but, as it’s an unusual find in this lovely riverside village, I’ve included it! Listed for 182,000 euros. The old Languedoc-Roussillon region was recently voted the fourth most popular tourist region in France (after Paris, Provence-Côte D’Azur, and the Alps), and the area has historically had a strong holiday rental market, making a property purchase a potentially attractive investment. Visitor attractions and activities include walking, cycling, wine tasting, and visiting historical and cultural sites such as the Canal du Midi and Carcassonne. From North America, you must first fly to Paris or London, then take a connecting flight to one of four local airports (travel time from Saint-Chinian given): Béziers (30 minutes), Carcassonne (1 hour, 15 minutes), Perpignan (60 minutes), and Montpellier (1 hour, 10 minutes). Alternatively, catch a high-speed train from Paris to Béziers, in the Hérault, and then taxi to the villages noted above. Is It Safe To Visit Languedoc, France? Given that France is still considered to have high terrorism threat levels, you may feel nervous visiting and investing in the country. However, despite attacks, storms, and strikes, France attracted almost 83 million foreign visitors last year, maintaining its ranking as the world’s top tourist destination in 2016, according to INSEE, the National Institute of Statistics and Economic Studies. The tourism sector’s recovery continues to be felt at the beginning of 2017. 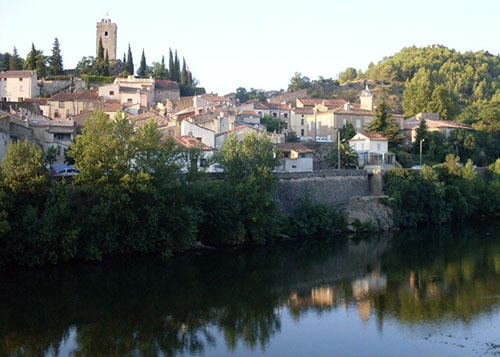 Plus, the Hérault is a rural area and unlikely to attract extremist attention. I’ve only touched on the very wide range of property in Saint-Chinian, Cessenon-sur-Orb, and Roquebrun, so I encourage you to explore further than the handful that I mentioned above. Editor’s Note: Lucy Culpepper is a Euro Correspondent for Live and Invest Overseas who has traveled to, written about, and worked in some 30 countries. She is originally from Wales in the United Kingdom and has lived all over the U.K., in Southern California, Spain, and France. I am a resident of Chile (Los Andes at the base of the cordillera) and a temporary resident of Spain. I love Chile’s weather but I find the cost of living very high and I would like to become a permanent resident of Spain. Where can I find a dry climate in Spain without the extremes of temperatures, i.e. unbearable hot summers and cold winters? I would consider the southern end of the Costa Brava region of Spain (avoiding Lloret de Mar—horribly touristy), and the northern end of the Costa Dorada (Costa Daurada in Catalán), notably Tarragona, Torredembarra, and the pricier, but lovely, Sitges. Just inland is the hilly Penedès wine growing region, and less than two hours’ drive away are the Pyrenees Mountains. These areas have four seasons, though spring is short—sometimes only a few weeks. There is a brief period of sticky weather (nothing like the Tropics) in July/August, but that brief discomfort is compensated for by lovely crisp winter days, which are sometimes warm enough to spend on the beach in shorts and T-shirt. The average temperature in July/August is between 70ºF and 75ºF; the average in January/February is between 46ºF and 48ºF. When I lived in Sitges, I would decamp if the August temperature was too high and head to Costa Verde on Spain’s northern coast. I’m thinking of moving with a young family. How do you find other families that are “retiring” with small children? I don’t know of one particular place where you can search for “families that are ’retiring’ with small children,” but, as you have probably already found out—and this applies to all cultures I have experienced—young children make it easier for their parents to make friends and contacts. They act like magnets! Every location I have visited or lived in with my children (Mexico, Costa Rica, Panama, Spain, and France), I made an effort to contact local expat groups through local notice boards and social media networks. Not because I was missing home exactly, but because it helped me to connect with like-minded people, many with children, as you’re looking for. You might not immediately find the exact profile you have mentioned in the group, but you will be amazed at how expat networks reach out to help. We met an expat family in Costa Rica with young children who we immediately bonded with. Seven years later, their eldest visited us in the U.K., and our children will, I’m sure, go out to re-visit them in CR… what I hope will be a lifelong friendship from a chance recommendation from another expat. I’m thinking of moving to France. Is the French immigration process difficult? Difficult? Maybe. Long-winded? Almost definitely. But that’s the case for most countries’ immigration systems. Fortunately, the French system has been tested by thousands before you and the information is clear. For up-to-date information, including all the details needed to apply for the Long Stay visa, visit the Consulate General of France in Washington website.